Sheza had a week off when she got home from training, time well spent eating, sleeping, eating, and mooning at the geldings over the fence line. 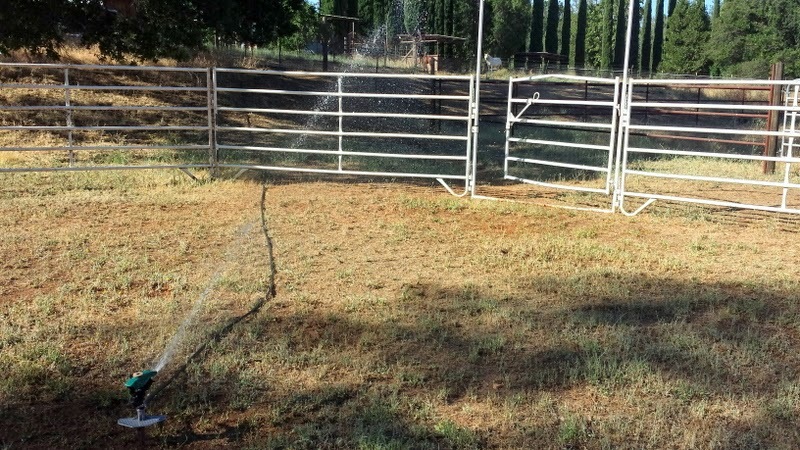 Meanwhile, the (clearly well used *cough*) round pen needed mowing if we didn’t want to wade through knee high thistles, and a sprinkler line put in if we didn’t want to expire in a 40 ft circle of dust. It’s certainly gratifying to come inside the pasture gate with a halter, call your filly, and have her head right over. 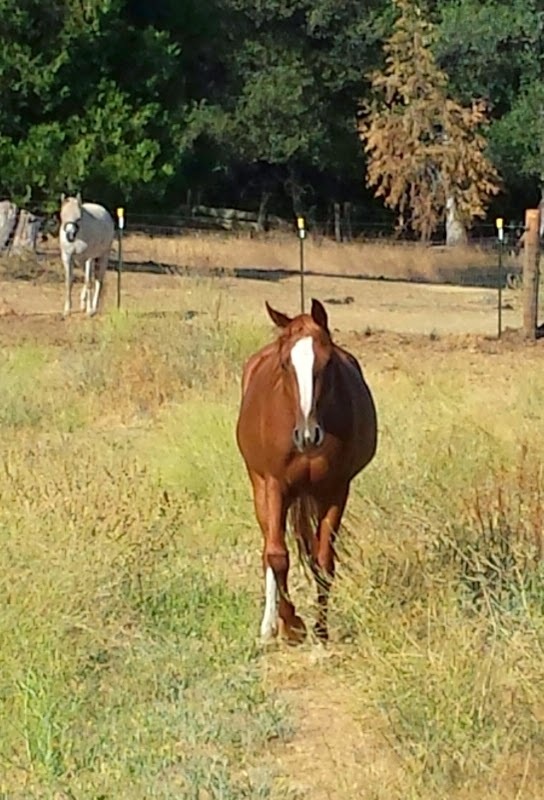 ❤ You may detect Scrappy the Bathorse's suspicious body language even from a distance in the photo below. 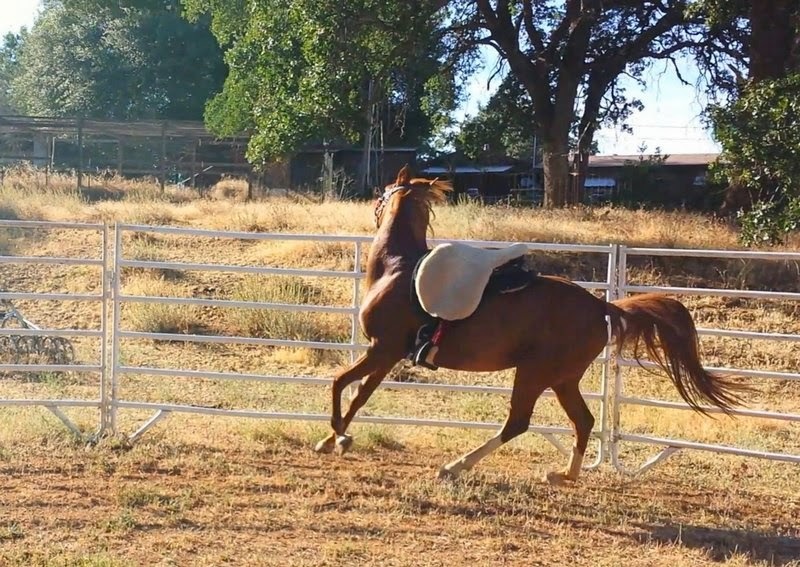 Since this was our first session at home as well as first solo effort, I hauled my tack and helmet down to the round pen but started working her just at liberty, tackless. Might as well start from the ground up and give her and I the best chance at succeeding together. Sheza essentially worked herself, in that I made her stay out on the circle and changed directions and speeds, but she moved her busy little feet around and around, burning off steam. She spent maybe 15 minutes with her head pointedly turned away from me on the circle, working herself, and then as some steam burned off and the direction changes started to get more polite, on one of the circles she finally checked in with me. She started to slow and wanted to stop so I made sure to keep her going a few more circuits until it was *my* idea to stop. Which she did quite nicely, and for her good work Sheza earned herself thinking time tied in the round pen while I went to get a drink. 😉 Impatience is in the bloodline with an extra sprinkle for Sheza and time spent tied which is clearly not her idea, is a great thing for her! When I found myself sufficiently re-hydrated, and more importantly Sheza had clicked over her brain and found herself standing tied at the Rail of Boredom, I saddled and bridled her, for which she stood like a rock! Sigh, swoon, hallelujah! Then it was time for her to move her feet again with the gear on. Sheza’s particular go-to move is the right ear spazz/head shake, inherited somehow from her mother Desire. Desire legitimately has a small scar on her right ear and her TMJ is often out so she may have pain there, but how her daughter managed to pick up her exact habit without pain or apparent reason I’m not sure! 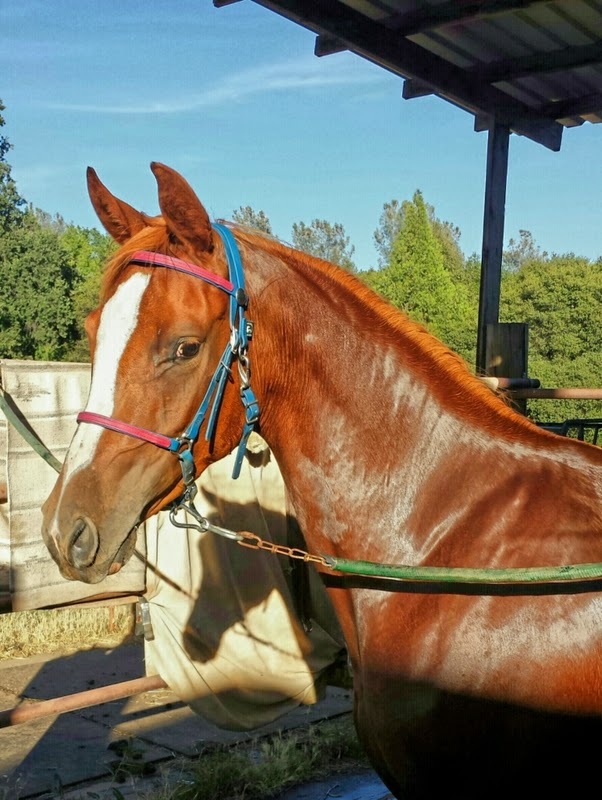 (Sheza has been chiro checked clear before going to training and will be checked again soon). April spent a lot of time working her with ropes and reins and junk tied over her ear so she just had to get over it but as we expected it’s her go-to spazz expressing move. So with the tack on, a little bit of hinky filly came out, and she exhibits that by again keeping her head turned away from me but also tilting her head to the right, head shaking a bit, always reverting to that “ERmahGawdMYEAR!.” It’s quite amusingly predictable I must say! 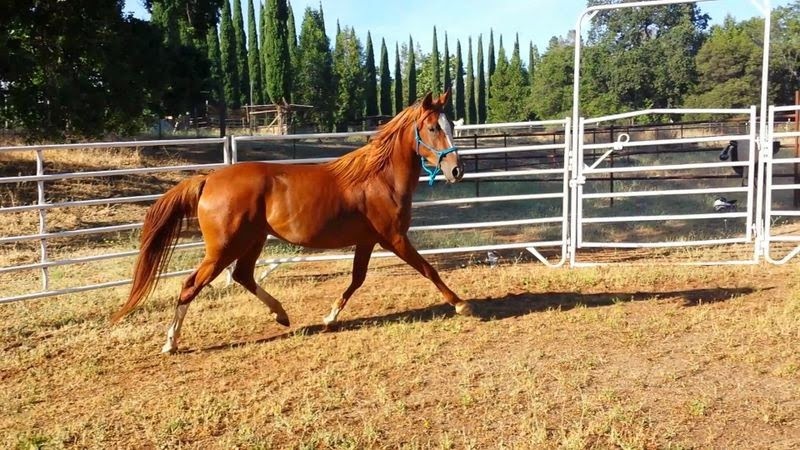 It only took maybe 5 minutes of moving her feet and a few direction changes to have a quiet licking and chewing filly working at a nice trot and not shaking her head. When I saw that we were done and I tighted my girth and got up in that saddle! Just as she had at April’s Sheza stood like a rock, even dropping her head, turning side to side to snuff each of my shoes. 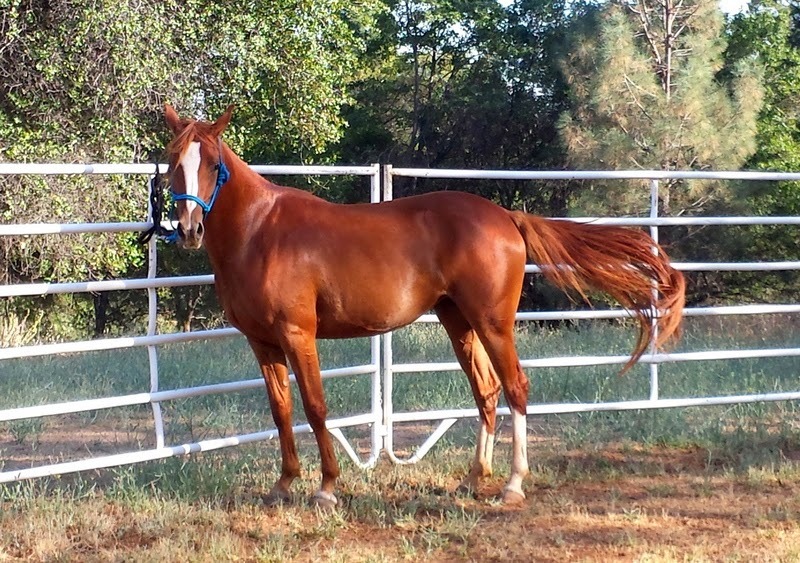 We opened the gate from the saddle–ah thank you April for those lovely leg aides installed–and rode out of the round pen and out around the big pasture on a “trail ride” around the little track in the lower acreage my husband scraped in with the tractor. First Sheza tried pretending she didn’t know what walking out and cues meant, sort of faltering uncertainly between my legs but I bridled her up a bit and moved her out and she was over that. Next she tried rushing forward a little, shaking her head BUTMYEAR!, but bending her side to side and a few circles curbed that. She is incredibly light in the bit and I already notice that the lighter I am, the lighter she is, as only makes sense. 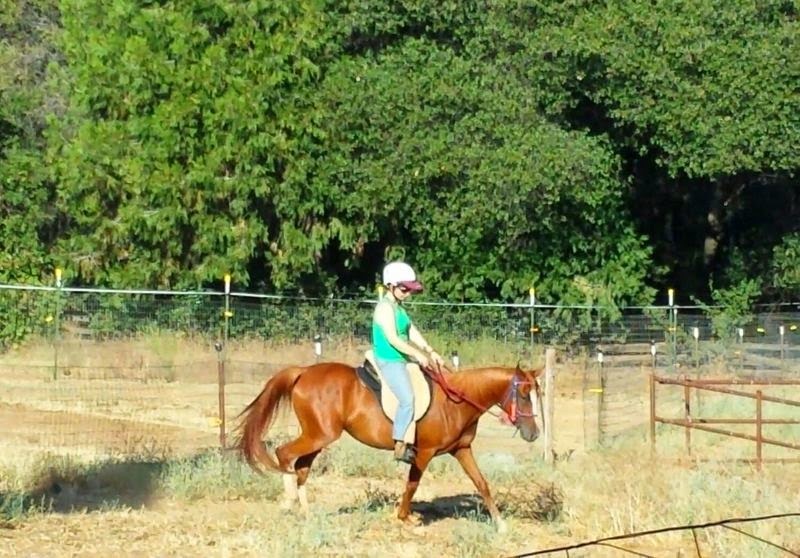 We did 2 or 3 good balks riding away down into the “terrifying” pasture she grew up in, including one good sideways sproing that tested my seat in the treeless, but I sat quietly and made her look at each scary thing, then collect on the bit a little and move on. Her responses transitioned then to a quiver in her skin and stop and stare, but much calmer. We circled a spare round pen panel laying the grass that had her snorting and staring, then when she was dropping her head to graze at various places we rode up towards the gate out. 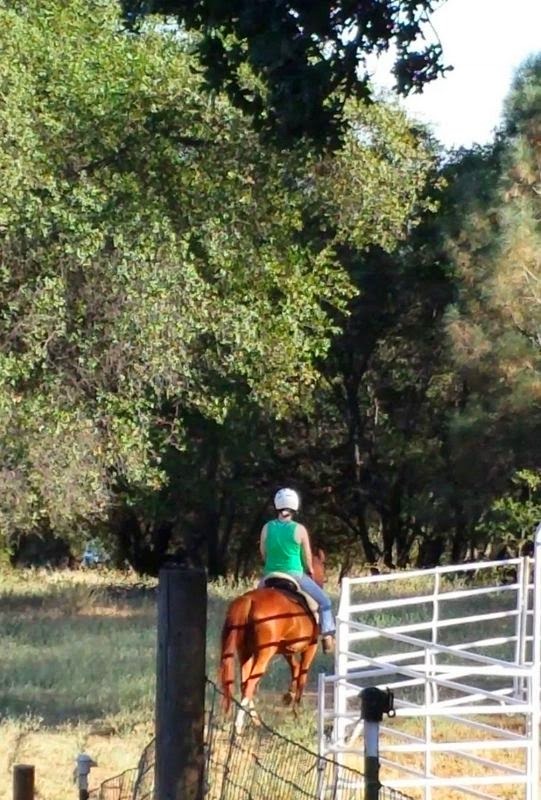 Sheza has always been a gate rusher and she’s the first one to clue into things like “gate means OUT!” whether under saddle or not. 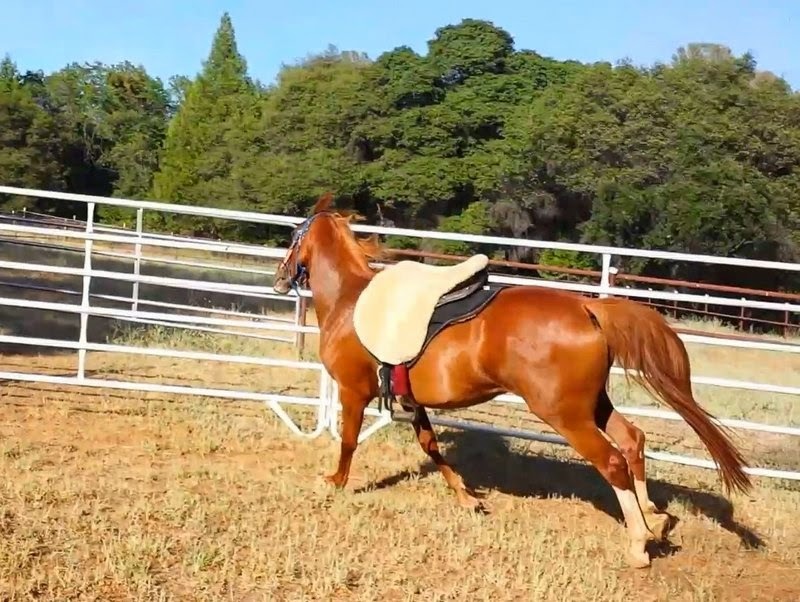 As we approached the gate she tried to brace against the bit and rush toward it but I bent her the other way with rein and leg and circled at the trot and walk until we were standing, bored, grazing, again. The big gate isn’t doable from the saddle so I dismounted at a mellow moment and hunted out my husband to take a few more photos! 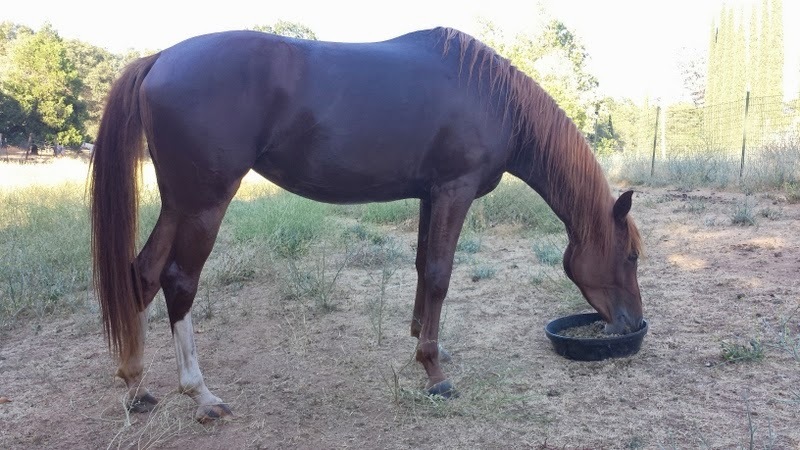 Nothing like a nice cool bath after a workout on a 100 degree evening, and a sloppy mash to boot! Sheza super model when the mash comes out. 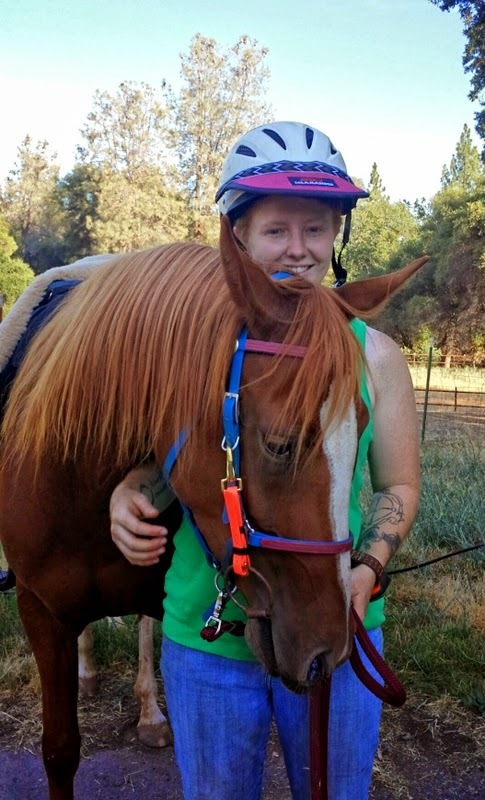 In other horsey news, Scrappy’s Skito pad for the treeless saddle should be here Wednesday and I have notions of getting a 25 mile ride in on him when it arrives to see if we have any business going to the Gold Country ride in a few weeks. Before that though he is heading to the round pen for some ground work and collection brush-ups. Hope you all had a wonderful and safe fourth of July, stay tuned and stay cool! LOL she is such a spazz-cake. I mean that in the best, most entertaining way. She's so GOOD – but her personality is so different from TKR or RC ya know? It's so interesting hearing about her and then you talking about rory or scrap. You are also motivating me to make time to go into the roundpen. I haven't becuase it's within a larger pasture that I have to maneurer through TWO other pastures filled with horses to get too….but I'm thinking with lunge whip in hand to ensure the other horses don't bother me and ML I could make it happen (I'm understandably a little gun shy about herds of horses+me and my horse since our last incident. Anywhoo, just wanted to drop a comment on how beautiful she is, how well she's coming alon, and how great you guys look together :). Seriously – let me know whenever I can help you get Sheza out on the trails. I'll even ride one of yours as a babysitter if that ends up being easier or more efficient for the time we have. Sheza Spazz indeed! 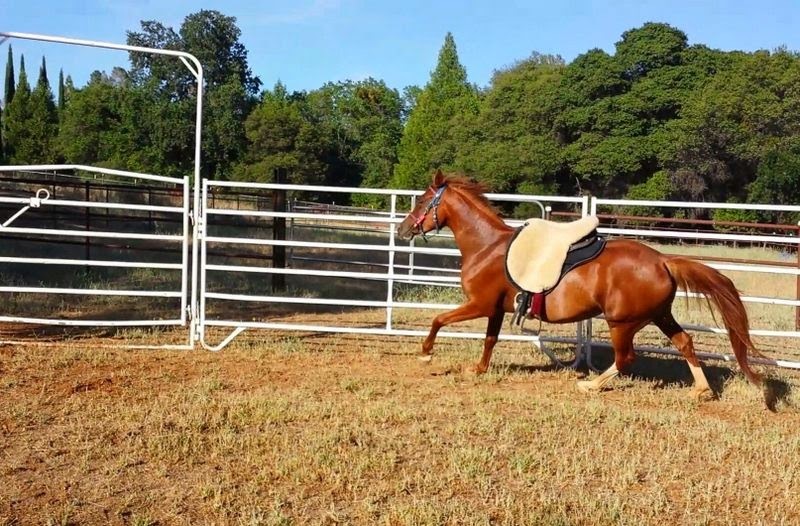 🙂 I am (obviously) guilty of barely using my round pen and I shouldn't even admit that I have an arena; of the two I think the round pen is infinitely more useful and will obviously be used a lot more with the two fillies coming along. I had anticipated round pen sessions with Rory about haltering etc when I realized how little handling she had but she's been so anti-Sheza in the drama and needing to BLARGH out department that I haven't had to have any sessions like that yet. In time, no doubt, but she certainly is a different character entirely. She is such a good-looking girl! What a fascinating herd of contrasting personalities you've got…you will never be bored, horse-wise! I think you're taking it so smart with Sheza — she definitely sounds like the type who will benefit from so much of this early, positive, slow exposure to things. She's so gorgeous, A. 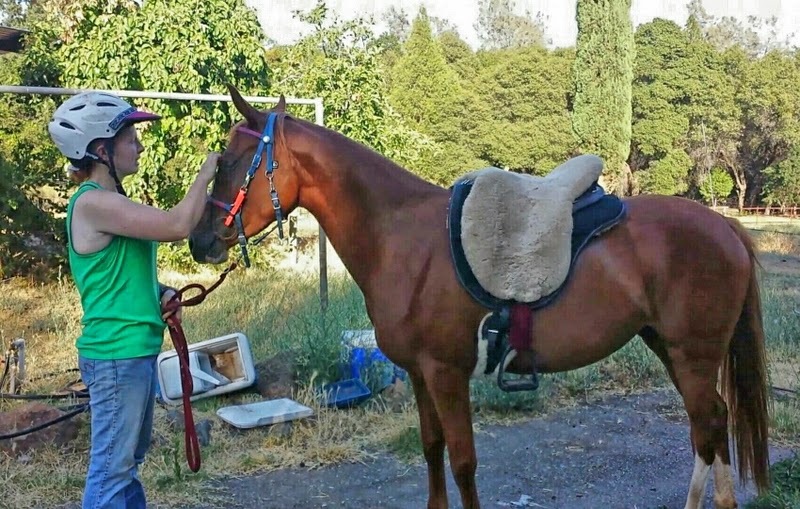 And you've really, like, leveled up in your horse-handling. You rose to her challenges!